HMAS Success recently conducted an astern Replenishment at Sea (RAS), a rare and challenging evolution that demonstrates Combined Maritime Forces (CMF) ships adaptability and capability to operate together, regardless of size and requirements. The astern RAS occurred on the evening of March 4, 2015 between the Australian Auxiliary Oiler Replenishment HMAS Success and the United States Coast Guard (USCG) patrol boat Aquidneck. At the time, both ships were conducting maritime security and counter-terrorism operations in the Gulf of Oman in support to the Canadian-led Combined Task Force 150 (CTF-150). A Replenishment At Sea (RAS) occurs to resupply ships on operations to maintain their presence at sea. It usually occurs with ships side by side and the refuelling hose passed between them. 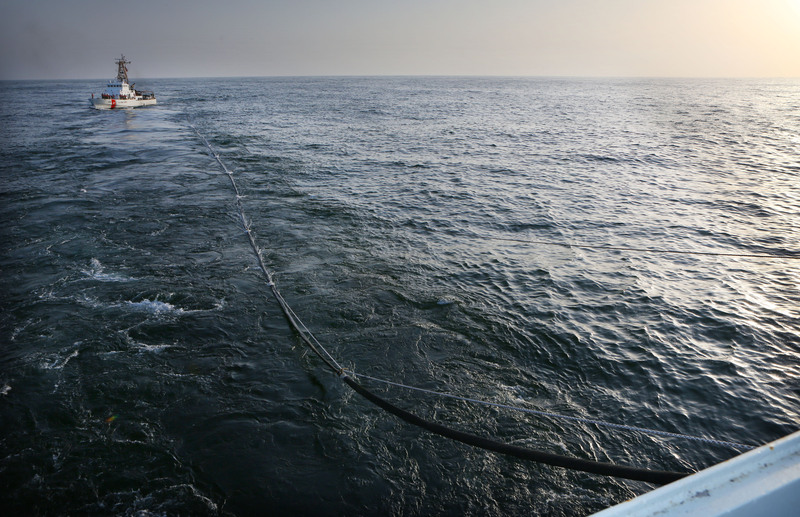 In the case of an astern RAS, the refuelling hose is streamed from the stern of the ship into the water and requires the receiving ship to pick up the hose out of the water. This is a rare evolution for oilers in general and the first recorded for HMAS Success. Warrant Officer (WO) Jack Ripper said in his 37 year career as a Boatswain in the Royal Australian Navy (RAN) he has only conducted three astern RAS. “This provided a unique opportunity to enhance our seamanship skills in presenting a different method to deliver fuel to our customer,” WO Ripper said. USCG Aquidneck’s crew preparing the ship for refuelling operations. WO Ripper supervised the quarterdeck aspects of the evolution, conducted by the Boatswain Mate sub department who laid out the fuelling hoses for delivery to the receiving ship. “Refuelling our own patrol boats is usually achieved via a ‘raft up’ evolution, where both ships stop in the water, but this type of RAS allows for the replenishment to continue while underway,” he said. “Working with the HMAS Success was great; their equipment, ship handling and professionalism was spot on which made the evolution extremely smooth, safe and successful,” added the USCG Commanding Officer. 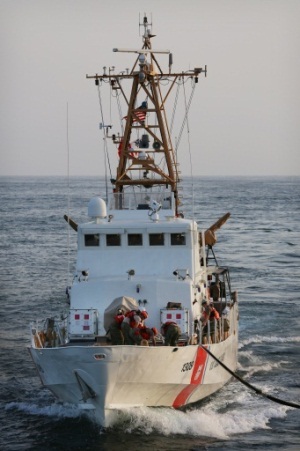 USCG Aquidneck recently joined CTF-150 operations, marking the second time since 2011 that a USCG patrol boat has provided direct support to CTF-150. “The crew are excited to work with CTF-150 in support of such an important mission. Knowing that what we do has a direct impact on global terrorism really validates to the crew that our presence and hard work within the region has real meaning,” said Lieutenant Marquardt.